The second son of Amunhotep III and Tiye, Amunhotep IV, was probably not the first choice of the pharaoh, but would have fallen to his older brother, Thutmose, who died under unknown circumstances at an early age (Aldred, 1988). Amunhotep IV's story begins at a time when the brave new dynasty of warrior pharaohs was beginning to become stagnant. The forging of a new empire, started by the pharaoh Ahmose at the beginning of the 18th dynasty, had raised the god Amun to a position of unprecedented power. Nothing much is known of the early life of Prince Amunhotep IV. His father's reign rarely mentions him. Amunhotep IV's age upon becoming pharaoh is a matter of guesswork because his age is never specified in ancient texts. But Prince Amunhotep must have been of an age to be able to sire children, since he had at least one daughter by the first year of his reign. This could place him at as young as eleven or twelve. Amunhotep IV's reign began with building projects including with a large sandstone quarry. He also took on the job of decorating the pylons his father had erected in the great Karnak temple complex. The decoration of these pylons gives us the first glimpse of things to come. We see the beginnings of the drastic changes the pharaoh would impose on official artwork starting to emerge (Redford, 1984). In the third or fourth year of Amunhotep's reign, close to the time of his decision to change his name to Akhenaten, the king decided to have a royal jubilee, known as a Sed-festival. Such festivals were usually celebrated on the 30th year of a pharaoh's coronation, and thus a celebration so early in Akhenaten's reign would have been unusual. The Sed-festival's purpose was to reinforce his divine powers of kingship. The festival marked a major turning point in Akhenaten's reign. Official art developed into the "early Amarna" style, which so exaggerated the unusual features of the king that it led some scholars to believe that Akhenaten may have suffered from some sort of medical condition. In the fifth year of his reign, Akhenaten undertook another major project. In perhaps his most dramatic effort, he abandoned the old capital city of Thebes and set out to create a new one in central Egypt in a previously uninhabited spot. He called his new city Akhetaten, or "The Horizon of the Sun-disc." The site of Akhetaten, now called Amarna, is a barren place surrounded by cliffs. The place resembles the symbolic horizon, and because it is located in the center of Egypt, may have been significant in Akhenaten's choice of this particular spot. Akhenaten laid out his plans for the city in great detail in a place he claimed to have been instructed by Aten to build. 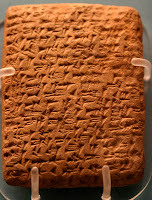 A large cache of clay tablets, known as the Amarna letters, was found in the city. In these letters, we see the disintegration of the massive Egyptian empire taking place. Despite continual requests for gold, which the king apparently ignored, Akhenaten continued to build his city, and further suppressed the traditional array of Egyptian gods. He began a campaign to erase the name of Amun from as many texts and monuments as possible. He even changed aspects of the written language, in one example altering the spelling of the word "mut" (mother) so that it no longer made reference to the goddess of the same name (Redford, 1999). In year twelve of his reign, Akhenaten held a large festival in which foreign dignitaries from all across the Egyptian empire visited and presented large quantities of tribute. The festival marked the beginning of the end of the reign of the "heretic king." In the years that followed, the situation at Akhetaten rapidly disintegrated. A spiral into tragedy started with the death of Akhenaten's second daughter, Meketaten (Aldred, 1988). Akhenaten's mother, Tiye, disappeared at about the same time as Meketaten, probably both having fallen victim to the plague that had by now spread into Egypt (1984). Nefertiti faded quietly into the background (what happened to her is not known), and princess Meritaten was soon elevated to the position of Chief Queen and married to a mysterious figure called Smenkhkare, who co-ruled with Akhenaten for a few years (Redford, 1984; Aldred, 1988). The last reference to Akhenaten appears on a wine jar docket dated "Year 17." He presumably died in Akhetaten of natural causes. Upon its rediscovery and exploration in the 19th century, Akhenaten's tomb lay empty save for some debris and the smashed remains of the king's red granite sarcophagus. The city of Akhetaten was abandoned and in left ruins. Akhenaten's experiment ended as abruptly as it had begun. After a brief occupation of the city by Pharaoh Tutankhaten, the successors of Akhenaten left the city and attempted to destroy all traces of this most mysterious and dramatic interlude Egypt's history. The story is told against a background of danger and intrigue, and condensed for space purposes, in my latest novel, a time travel, ETERNAL HEARTS, due soon from Highland Press.